It's been a few years since Audio Adrenaline's last project, when we all said goodbye to one of the most memorable Christian bands. But this year, Mark Stuart and Will McGinniss from Audio A joined with a group of other worship leaders to form Know Hope Collective, bringing the listener a ten-track project full of heart-felt worship and beautiful music. Know Hope Collective's self-titled debut begins with "Attention," beginning alive with the heart-felt worship that this group has to offer. I very much enjoyed this opening track, filled with marvelous vocals and encouraging lyrics, especially the main line of the chorus: "Speak/ You have my attention." "Sanctuary"'s highlight was the switch-off between male and female vocals, and the simple, yet amazing lyrics with the reminder that we are the sanctuary of God. Know Hope Collective delivers their version of "Build Us Back" next, the song popularized by Newsboys, but written by Mark Stuart and Jason Walker after the destruction in Haiti. Although not quite as powerful as Newsboys' version, the harmonizing that appeared in the bridge was a definite highlight from this beautiful worship track. In addition, the group remade Audio A's hit "Hands and Feet," sounding almost identical, yet different in the respect of the vocals. "We Remember," also popularized by the Newsboys on their Born Again album, follows, speaking of remembering all that God has done for us. It is followed by perhaps one of Audio A's biggest and most recognizable hits "Ocean Floor." I really enjoyed this version, although Mark was not the main singer of this song, making for a bit of a change again here. "Spirit Speaks" has a very timeless message with beautiful music speaking of how the Holy Spirit is everything we need ("You are the air I breathe/ still You move inside of me/ You are the song I sing...) while "Jealous God" is largely piano and string-based, speaking of how God desires an intimate relationship with us and is jealous for that: "You are a jealous God for me/ nothing else has ever felt this real to me/ You're a jealous God." This track built very nicely by the bridge, making for an extremely worshipful track worth putting on repeat. Know Hope Collective also covered Audio A's popular "Good Life," but in a different (and almost better) way, being more worshipful and melodious. Finally, Know Hope Collective's debut ends with "Just to Be Here," a gorgeous worship track about the beauty of being in God's presence "where heavens meets the earth/ our King is this place and we can't find the words." 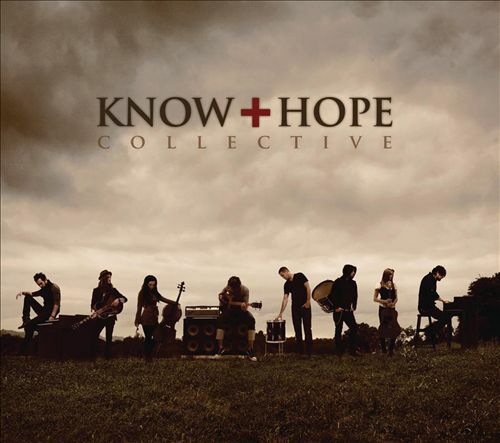 I admired Know Hope Collective's self-titled debut for the heart-felt worship and Audio Adrenaline correlation. But while Know Hope Collective may have covered some popular Audio A hits, Mark wants to make it clear that this group is no longer Audio A: "We have to be clear that this isn't Audio Adrenaline anymore. It isn't run around and get crazy rock and roll music like 'Big House' was. I loved every minute of that, but this is a moment for us to go out and encourage people that there is hope even in brokenness." And hope in brokenness is just what Know Hope Collective gives through this amazing worship album. If you are a fan of Mark and Will, you will want to check out this album, and I would also recommend it for fans of Hillsong Live for its amazing worship.